When momentum develops, it can become a driving force greater than fundamentals and rational considerations. Such was the case for the market in Q4 2018 and with the S&P 500 (SPX) falling into a technical bear market and such has been the case in Q1 2019 with the S&P 500 rallying some 17%+ off the December 2018 bottom. It’s tough work being a permabear in 2019 thus far and with the S&P 500 up nearly 11% year-to-date, but bulls shouldn’t hang their respective hats on 1st quarter gains. There is still a great deal of time remaining in the calendar year and a great many obstacles for the market to overcome in order to not only maintain the current gains but find all-time high trading levels. The most significant headlines that surfaced last week came in the form of economic data. It’s not all that often, of late, that we can suggest such commentary and with the geopolitical backdrop seemingly carrying the greatest impact on markets. From the U.S./China trade feud and a potential U.S. government shutdown (now averted) to Brexit concerns, the financial media has continued to feature and focus attention away from the economic data and toward geopolitics. For the sake of brevity and with regards to the ongoing U.S./China trade talks, it seems as though progress is slow going, but going nonetheless. Both the United States and China reported progress in five days of negotiations in Beijing this week, but the White House said much work remains to be done to force changes in Chinese trade behavior. At a White House press conference on Friday, President Donald Trump said the talks with China were "very complicated" and that he might extend the March 1 deadline and keep tariffs on Chinese goods from rising. Chinas vice premier and chief trade negotiator, Liu He, and Lighthizer are to lead the next round of talks this coming week in Washington, according to Reuters. As the calendar edges ever closer to the March 1 tariff deadline, even with President Trump’s accommodative stance on further tariff implementations, we would expect the market to hang on every headline coming out of the ongoing negotiations, but for now let’s review some of the key economic data releases from the prior week and outline the data set to be released this week. As the tax reform/stimulus brought about an acceleration of the economy through much of 2018, that stimulus simultaneously creates a high bar for which economic slowing is the likely outcome in subsequent years. We’re already experiencing the hangover effects from those lofty earnings and revenues in 2018 that are now producing negative S&P 500 earnings forecasts in Q1 2019 with greatly reduced, albeit positive, revenue estimates. Certain economic data points are also slowing and proving that geopolitical and domestic political tensions have resulted in curtailed sentiment in many aspects of the economy. Probably the most disappointing piece of economic data for the week was the Census Bureau’s December monthly retail sales. For the month of December, the Census Bureau reported an MoM decline of 1.2%, with a rise of 2.3% year-over-year. The data was met with much conjecture as it proved to be the worst MoM dip in retail sales since 2009 and was delivered nearly 2 months late and due to the government shutdown. 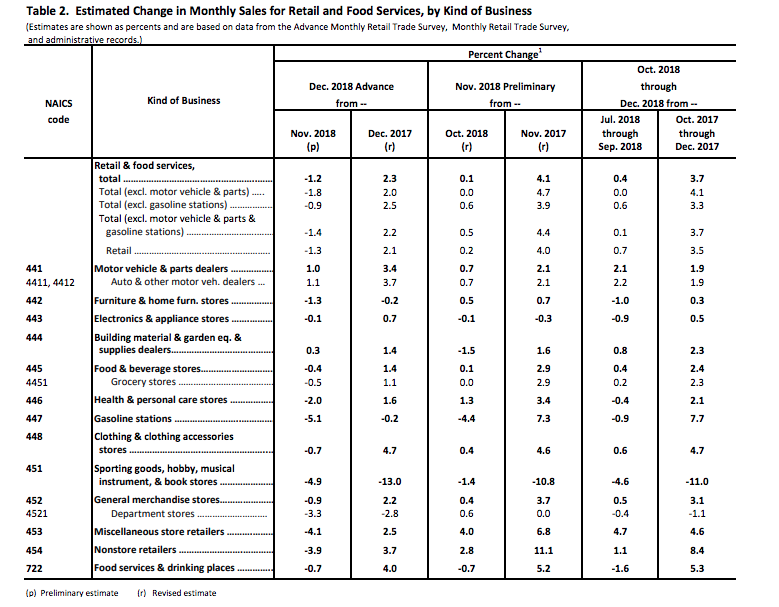 But within the report there seemed to also be a great deviation of a trend as it pertains to Nonstore retail sales, which showed a decline of 3.9% MoM, something also not seen since the Great Financial Crisis and yet the economy isn’t or hasn’t produced any like conditions. Within Finom Group’s weekly State of the Market (SOTM) video, I dive deep into the monthly retail sales report and explains why the data is found with errors and will likely see significant revisions. Within the monthly retail sales report there are some red flags in the data that just don’t make logical sense, mainly the Nonstore sales decline, which does not coincide with what Amazon (AMZN) reported in its quarterly filing and as the conglomerate constitutes some 50% of Nonstore/online sales in the United States. And then there’s the December and January Nonfarm Payroll data that saw each month adding more than 300,000 jobs. "This is against the backdrop of the only data we had, which was the blockbuster employment numbers," said Diane Swonk, chief economist at Grant Thornton. "If the world was that bad, that was the place we should have seen it and we didn't. It leaves us all scratching our heads. It's suspect, highly suspect."